A group of Sapulpa elementary students and teachers donated their ponytails to Children with Hair Loss, a non-profit that provides human hair replacements at no cost to children and young adults with medically-related hair loss. 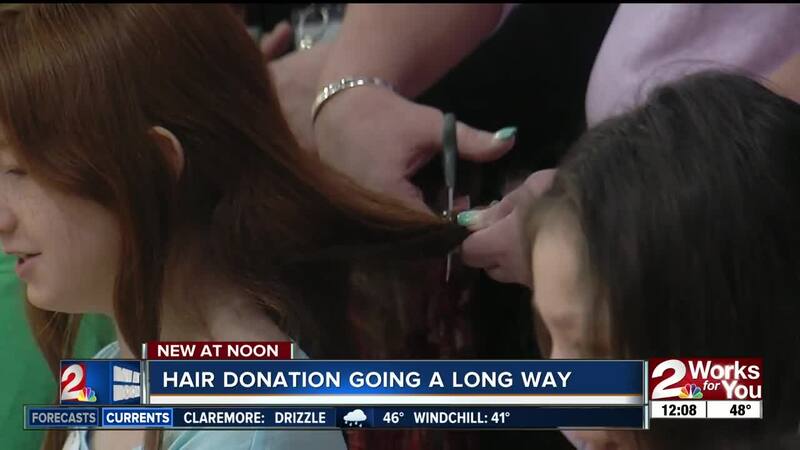 SAPULPA, Okla. — Hair donation in Sapulpa is going a long way. A group of 20 elementary students and teachers chopped off their hair Monday morning. At least eight inches was cut off inside Freedom Elementary School's gymnasium. All the ponytails will be donated to Children with Hair Loss , a nonprofit that provides human hair replacements at no cost to children and young adults with medically-related hair loss. According to the organization's website, a hair replacement system and care kit for a child with hair loss can cost up to $5,000. "I have a cousin of mine who passed away when she was 21 of glioblastoma," said Eryn Wallis, a school counselor at Freedom, who started the donation event three years ago. She said she first did it in honor of her cousin and decided to bring it to the school to teach kids about acts of kindness. In 2017, the school donated 27 ponytails.